The Doctor and Mel attempt to free some unfortunate test subjects of the Sontarans, only to discover there’s something worse than military potato heads lurking about. That something poses the question: what, if anything, could scare a Sontaran? After a good hour and a half of opening and shutting doors, running up and down stairs, tinkering with ailing computer systems, mucking about with stones and dust, and trying not to get killed by the toxic atmosphere or angry Sontarans, we find out. The answer is a creative spin on a couple time-worn SF tropes, but the execution is somewhat muddled. There’s an awful lot of shuffling from point A to point B, shouting and gibbering, and not enough plot to pad out two hours. The ending feels more like a buzzer signaling the end of a match than the resolution of a story arc. Also, while this may be because I’m hard of hearing, Terror of the Sontarans is one of those rare Big Finish audios where a chaotic jumble of sound effects and/or heavy voice modulation made several scenes unintelligible. I can’t tell whether this story is supposed to be a suspenseful horror story or a treatise on What It Means to Be Sontaran. If the former, then it needs tighter pacing, less chitchat, and more focus on the horror. If the latter, then it needs more than a slightly unhinged field-major berating bewildered subordinates. Ironically, I feel like audios with defective or dishonoured Sontarans gave us a better window on the Sontarans (The Sontaran Ordeal, Heroes of Sontar, even The Five Companions) than this outing. 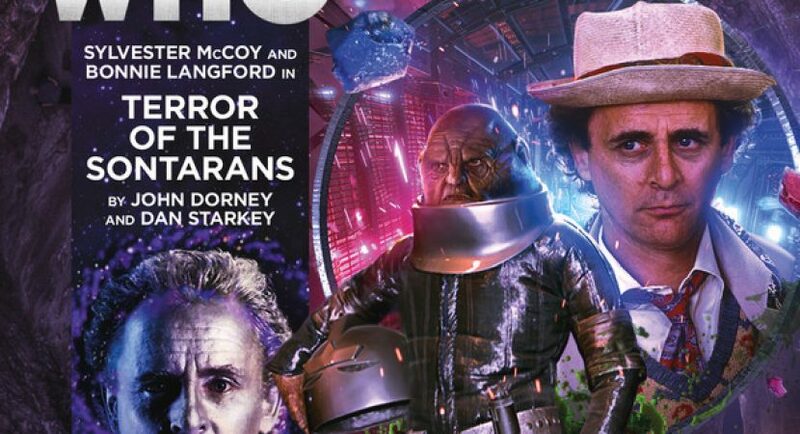 Part of the problem is that the authors struggle to reconcile two clashing versions of them: the competent and fierce tacticians of classic Who, and the comedic buffoons of the new series. That said, Dan Starkey is brilliant as always in his portrayal of his favorite aliens, particularly Field-Major Kayste. The prisoners are a colourful bunch as well: an easygoing stage performer, a warlike crustacean, a boastful space adventurer, and a nun who spends half her time meditating and the other half spouting platitudes. Mel and the Doctor both spend a lot of time cat herding these people (when they’re not being herded), Seven in his kinder, gentler Season 24 incarnation and Mel in her Big Finish “oh, that’s right, she’s a plucky computer nerd, not just a screaming assistant” incarnation. (Bonnie can’t scream as well as she used to, and thankfully BF doesn’t feel the need to blow out our eardrums). Mel: People in cells are usually dangerous. Doctor: Nonsense! I’ve been in plenty of cells over the years, and I’m a puppy dog. Mel: You?! You’re the most dangerous person I know. Entertaining characters just about make up for the plot/pacing problems. I think this story would suffice as a classic Who TV serial, but not a particularly memorable one. Wasn’t it odd? Apart from Spare Parts, I can’t think of many classic Doctor Who stories that ended with a reset instead of a resolution. After all the Doctor’s talk about how this new life form needed to model itself on more ethical and less bloodthirsty minds than the Sontarans, I was quite surprised when Ketch did not offer to stay and help. This strange world seemed like a place where he would not be regarded as a freak. Both arcs would then have resolved in a way that felt like progress, not just reverting to the way things were before the Doctor arrived. Another thing that puzzled me: The Doctor and Mel were responding to a distress beacon, but the Sontaran expedition under Field-Major Kayste were responding to an SOS with a full recording. I suppose Skegg had time to launch the one and send the other, but on my first listen I was baffled as to why the Seventh Doctor and Mel didn’t know what they were getting into.